Barn Owls are moderately common, but generally hard to see, as they are mostly active at night. During the day, the birds roost on concealed tree branches. They are the most widespread and familiar of the owls. 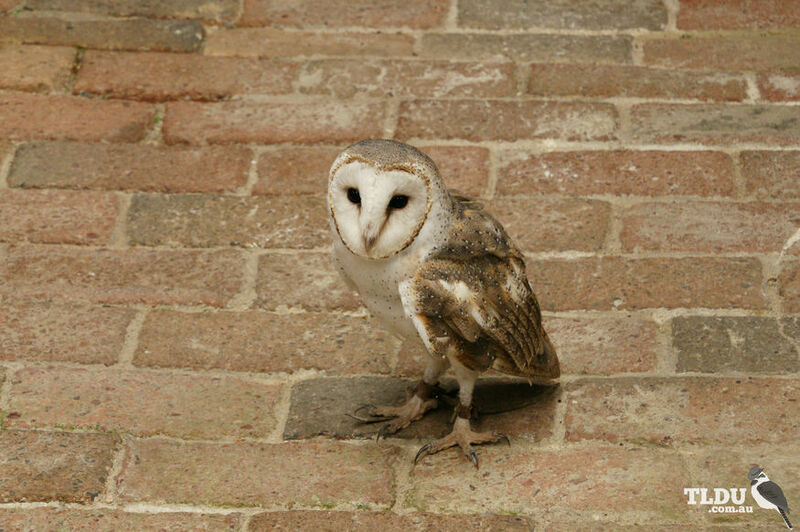 Barn Owls are medium sized birds (females slightly larger than males), with a 'heart-shaped' facial disc. They have sandy orange and light grey upperparts and white to cream underparts. Both the back and breast are evenly spotted with black. Birds often appear whiter than normal when illuminated in car headlights or torches. Young birds are similar to adults in plumage. When threatened, the Barn Owl crouches down and spreads its wings. Barn Owls, are smaller and generally lighter in colour than Masked Owls, (35 cm - 51 cm), which are otherwise similar nocturnal birds (night birds). 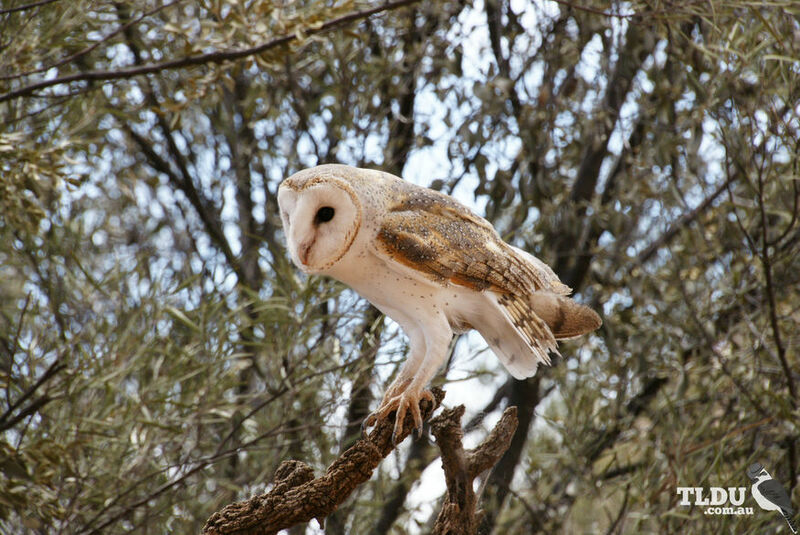 The Barn Owl is found throughout Australia. Its distribution is limited only by habitat and food availability. By day the Barn Owl roosts in hollow logs, caves or dense trees, and is usually seen alone or in pairs. The preferred habitat is open, often arid (dry) country, such as farms, heath and lightly wooded forest. Barn Owls feed mostly on small mammals, mainly rodents, and birds, but some insects, frogs and lizards are also eaten. One of the more favoured foods is the introduced House Mouse. Barn Owls hunt in flight, searching for prey on the ground using their exceptional hearing. The heart-shaped structure of the facial disc is unique to these types of owls. The slightest sound waves are channelled toward the ears, allowing the owl to pinpoint prey even in complete darkness. Barn Owls have no definite breeding season. Breeding takes place mostly in response to food availability and often twice per year. The nest is normally a hollow in a tree, but birds sometimes nest in caves or abandoned buildings. The entrance hole is usually 15 to 25 m above the ground, though the nest chamber may be up to 10 m down inside the tree. No nest material is used, except a few old pellets, which are the regurgitated indigestible leftovers of small mammals and other prey. The pale white eggs are laid at two-day intervals. The female alone incubates the eggs, but both parents care for the young. The young will perch in the vicinity of the nest site and be fed by the adults for a further month or so after leaving the nest.